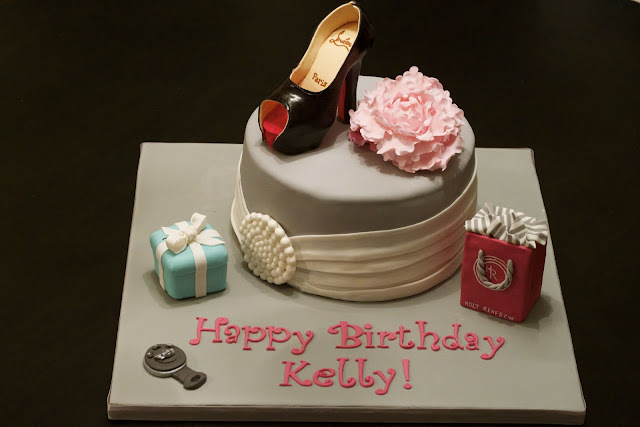 When I was asked to make a cake with a fashionista theme, I didn't know if I would be able to meet the challenge. 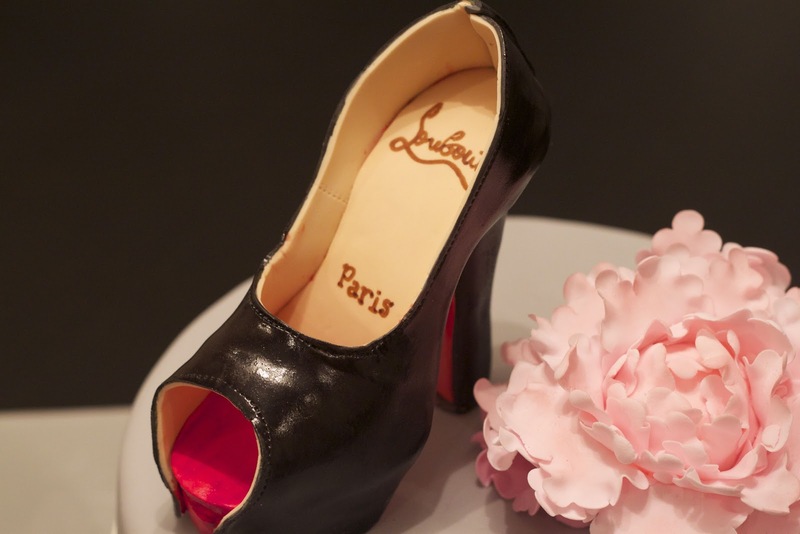 The scariest part was that I had never made a shoe before and it was a rather important part of the cake. 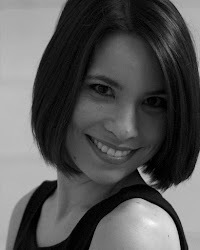 Other minor challenges included not having very much experience (i.e. 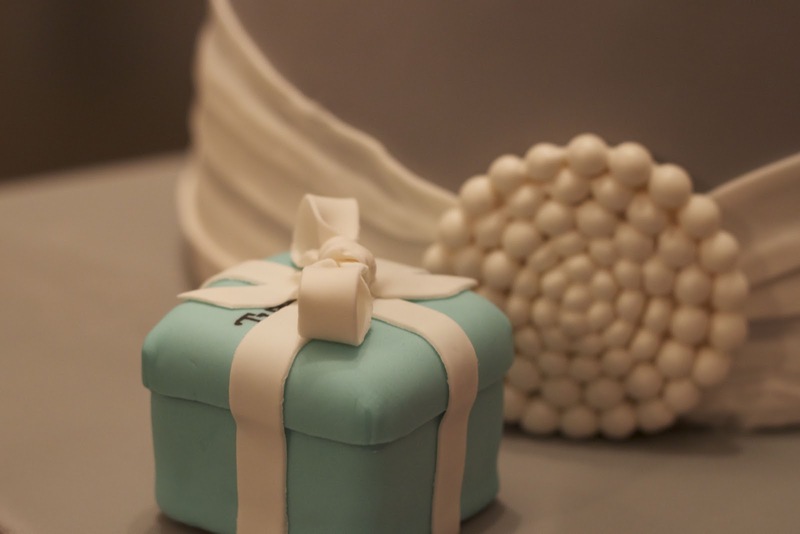 no training) in making flowers, no experience with pleating and using a temperature sensitive cake filling (cream cheese frosting) requiring refrigeration of the fondant-covered cake. I was pretty much given free reign with the design of the cake. 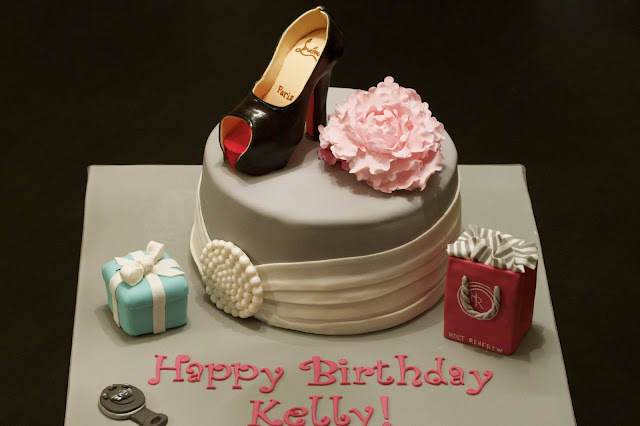 I decided to go for an elegant cake design personalized with the birthday girl's likes: her favourite colour (grey), Christian Louboutin patent peep toe pumps, Tiffany & Co., Holt Renfrew and Mini Cooper. The requested cake flavour was carrot with cream cheese frosting. Since I needed to refrigerate this cake, I decided to use a different fondant. I used Satin Ice as I had read that refrigeration doesn't compromise the look or texture of the fondant. I had also read however that the fondant also dries very quickly and thus leads to a greater potential for an 'elephant skin' look to the fondant which is not desirable. The only time I've ever had an issue with 'elephant skin' was when I participated in a class where we were instructed to use corn starch rather than confectioner's sugar for rolling out the fondant. I found the corn starch really dried out the fondant. With this in mind, I made sure to use confectioner's sugar rather than corn starch to prevent sticking, and I also tried to work faster to cover the cake. I was disappointed to have some spots with a more rough texture. 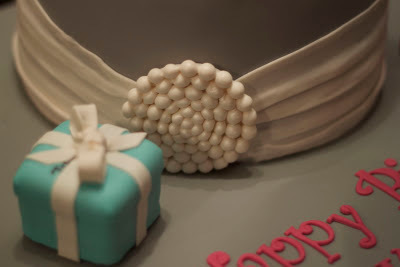 Luckily, I was covering the cake in pleating, so I was able to cover these spots. Overall, the fondant did set quite nicely and most importantly, not one drop of condensation or stickiness when I took it out of the fridge. I did take precautions with this though and put the cake in a box, wrapped the box in plastic wrap and also adjusted the temperature in the fridge (I have an extra fridge that I can use just for cake stuff). I also kept my house temperature on the cold side. Based on the performance of the fondant with refrigeration, I think the brand is a keeper for me. I might just knead a bit of shortening into it before rolling out although this doesn't seem to be recommended by the manufacturer. This was the first time I had tried to make a realistic-looking flower. I think that it still ended up taking on more of a fantasy flower look than a real peony but I think it was still pretty. The last time I made a peony-like flower, I used modelling paste rather than gum paste alone. I found that it was too soft to work with and therefore the edges of the petals would tear when thinning them with a ball tool. This time I used gumpaste. 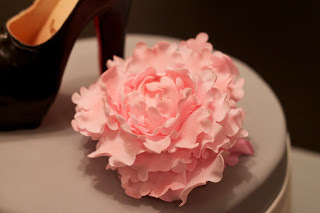 It was easier to roll out very thin pieces of fondant and shape the petals. The gumpaste did set very fast though and didn't allow very much manipulation of petals after the flower was done. 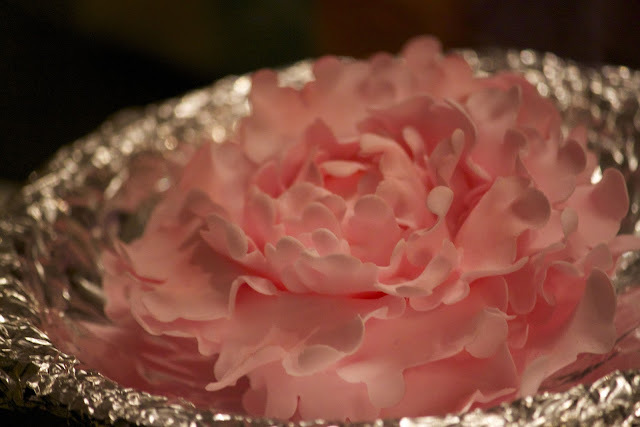 I set the flower in a bowl covered with foil to dry. I think next time, I will make the foil more shallow so that the petals at the bottom of the peony will be more open. When I placed the peony on the cake, I filled in the bottom with a few extra petals. I did a very light dusting with pink petal dust to give the petals a more realistic shading/colouring. The brush I was using wasn't quite soft enough so I had to be extra careful as the petals are very delicate and fragile. The birthday girl drives a Mini. 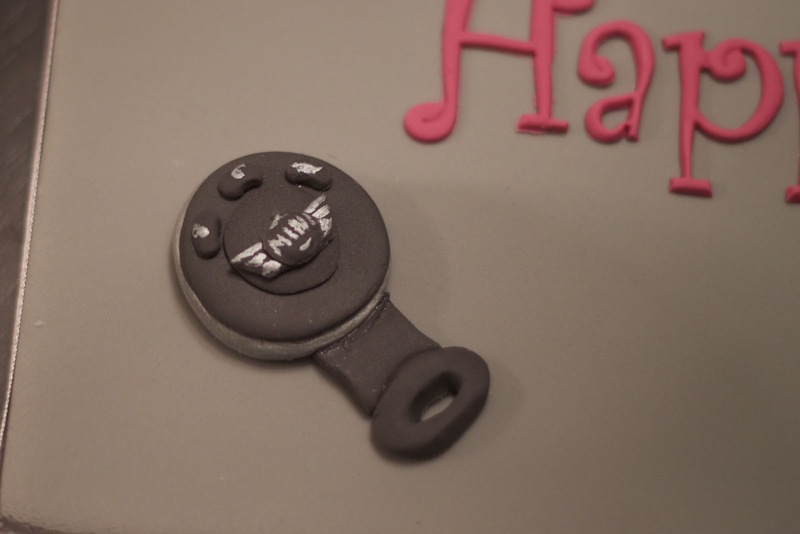 Rather than putting a car on a fashionista cake, I decided to put a the key fob on it. This was made from 50/50 or half gumpaste and half fondant. It was challenging painting the logo on it as the key was quite small. I used a 000 size brush, but even so, I barely squeezed the word 'MINI' on it. The Tiffany box is made from Rice Krispie treats. I discovered that pre-made treats are much easier to work with then homemade treats. It is easier to make a more compacted and smoother structure. In the past, I have noticed that it is more difficult to really compress homemade treats so that the shape will be stable. Although the gumpaste ribbon covers most of it, I did paint the logo on the top of the box. 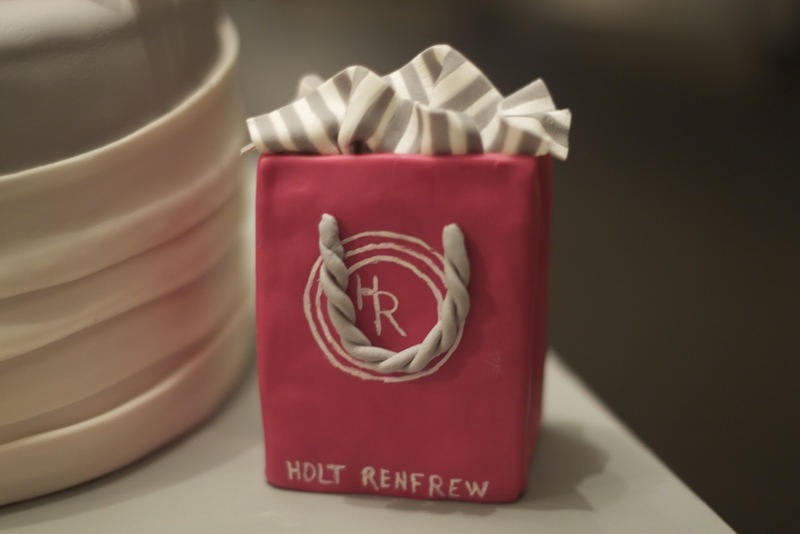 The Holt Renfrew bag was one of my favourite things, mostly because of the striped tissue paper. For some reason, I found it difficult to get the right colour for the bag. It took two attempts and a lot of combinations of gel paste before I got a colour I was satisfied with. I started with 'fuschia' but found it was just too dull. I ended up brightening it with electric pink gel paste. I painted the logo onto the bag using white petal dust mixed with a bit of vodka. The striped tissue is made with gumpaste and the handle made with 50/50 and an extruder. At first when I thought about using grey on a cake I thought to myself that it wouldn't be a very appetizing cake colour. After looking at a few images of grey cakes, I thought it could look rather nice - modern and elegant. To make this grey cake visually more interesting, I added white pleating using 50/50 and a gumpaste pearl medallion. I brushed the pearl medallion with a bit of lustre dust so they looked more authentic. I think that they grey and white went very nicely with the pink of the peony and Holt Renfrew bag. Now for the shoe. I had less than two weeks to figure out this shoe and after researching online, I found that it was recommended to let the sole and heel dry for a week. 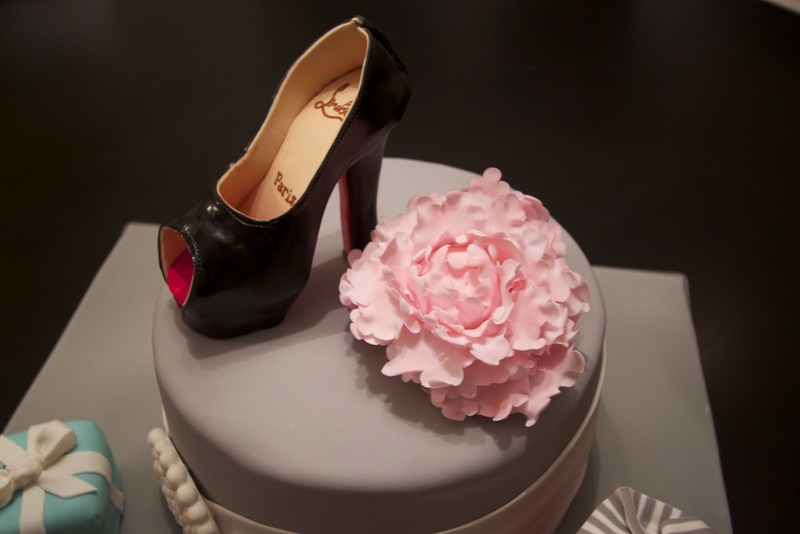 This meant that if the shoe broke, or looked awful, I would need to think of something else to put on the cake. 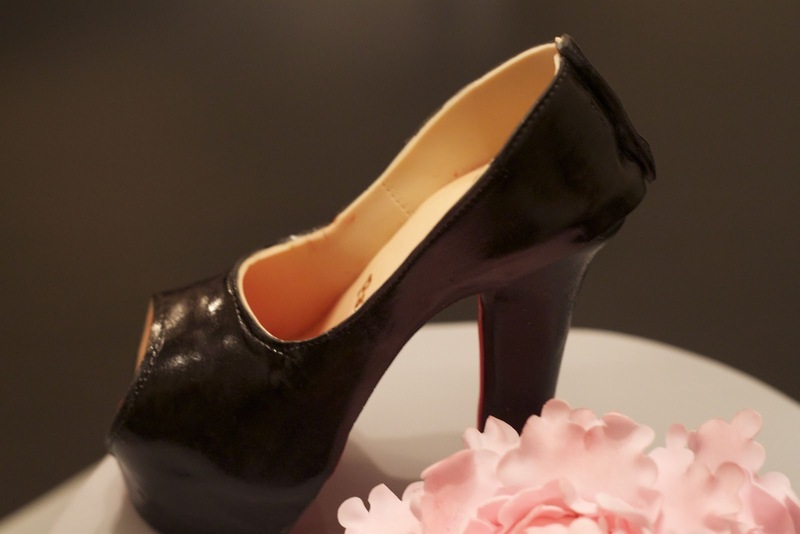 To make the sole, I carved a piece of foam to a high heel shape and covered it with parchment. I allowed the gumpaste sole to dry for 5 days along with the heel. The biggest challenge and scariest part of the shoe was the fact that it was a pump and not a sandal, meaning that I had to figure out how to cut out one piece of gumpaste to fit around the whole shoe. A sandal would have been much easier for a first shoe attempt but I was told the birthday girl had a pair of patent peep toe pumps. I'm not the best person at looking at a 3-dimensional item and being able to transfer that into a flat shape that can become a 3-dimensional item. I think I had a brain teaser game that had challenges like that - I was awful at it. I tried to make a paper template by making a foot shape out of old fondant I wasn't using anymore. This got me closer to figuring out the general shape that it had to be but it was difficult to bend the paper around the shoe to see if it would be the right fit. I need to use something more flexible to make the template, so I decided to use the medium that I would be making the actual shoe with - gumpaste. I was really happy with the curve of the arch on the pump. I don't think that I could have hoped for a better outcome for a first shoe attempt. I think the peep toe was a bit large but that's just me being picky! To get a 'patent' look, I used 2 coats of vodka mixed with black gel paste. I am very proud of this cake. It was a great learning experience as I figured out quite a few new techniques. I'm not sure how soon I'd like to try another shoe though - it may have been beginner's luck!